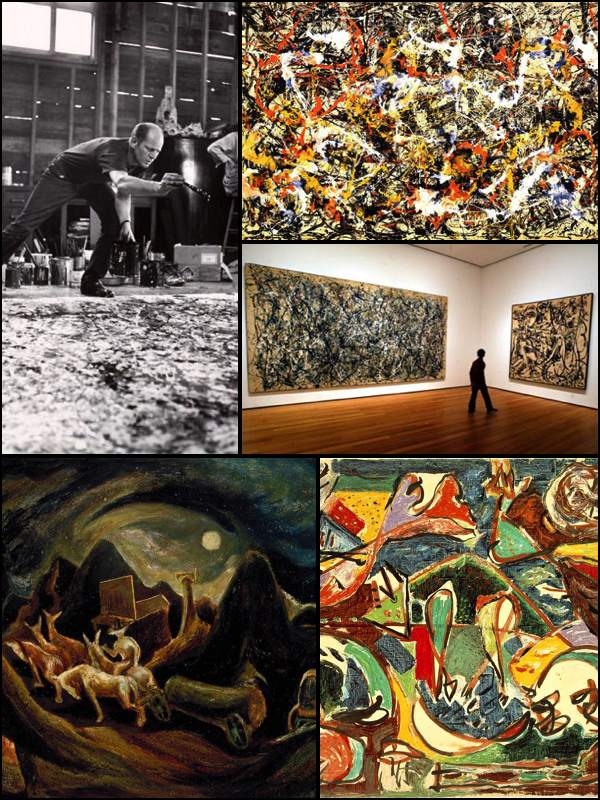 I find Jackson Pollock to be an incredibly interesting figure in the history of art. I enjoy talking with people about him because there are strong feelings about his work… most people either do not like it and/or do not understand it. I felt the same way for a long time… so I did some reading about him. He had a troubled childhood and wanted nothing more than to be an artist. His early works (the bottom 2 images in the collage above) were marginal at best. He struggled with a direction and style for many years. He was shy and struggled to express himself about his works. Once he hit upon his famous drip style, his career took off after he was featured in Life Magazine and he was a major part of the Abstract Expressionist movement. The thing to remember about Abstract Expressionism is that is about being creative without needing to represent something. In Pollock’s case, it was simply using a brush and paint to express himself. Once I was able to grasp this concept about his work and all Abstract Expressionist work it was easier for me to understand why they worked in this manner. You can see my post here for more about Abstract Expressionism. I experimented with this concept of painting while in college and honestly can say that I see the attraction… being able to use the brush and paint, without a great deal of thought or direction to simply express myself in the moment. I DO see the difficulty that non-artists/creatives have with it as it can tend to just look like nothing. I think that Pollock is an important person in the art world as he turned the focus of art more towards just expressing yourself… getting it out… letting go. Something we should all work on. He was emblematic of the tortured soul and struggled with his own demons. He suffered from depression and alcoholism and died on August 11th 1956 while driving under the influence of alcohol. There is an excellent 2000 film starring Ed Harris entitled “Pollock” that is based on an equally excellent book “Jackson Pollock: an American Saga by Steven W. Naifeh & Gregory White Smith that I highly recommend. I love his paintings BTW. Glad you enjoyed it. His work gets copied a LOT. The Link works! Thanks. I did some more research on it and it looks like it may be legit. I love stories like that!